Will Nigeria Put Smiles On Workers' Faces Anytime Soon? 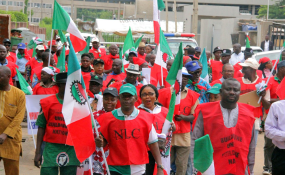 Abuja — The Nigeria Labour Congress (NLC) has said it would resist any attempt by the federal government to implement a No Work No Pay policy. NLC president, Ayuba Wabba while reacting to the Federal Executive Council (FEC) white paper on No Work, No Pay policy said workers would also implement a No Pay No Work policy. He said, "The right to strike is a human and trade union right and can not be wished away, that's why strike is legalized by our laws, and had been excised since colonial era to date. "The right to strike is what differentiate a worker from a slave. Just like the right to strike, right to picketing, the right to work". He said that it is morally and legally wrong to apply a phrase in a body of law without respecting all other provisions of the same law, adding that the same law provides that a workers wage is due after 30 days, "where this and or any collective bargaining agreement is violated it is legally and morally justifiable for unions and workers to apply "No pay No Work." He warned that the threat of no work no pay can not therefore deter workers and trade unions from exercising the right to strike. "There are clear procedures provided by law to embark on a strike, once the legal requirement is met no work no pay can not apply", he said. Copyright © 2018 Leadership. All rights reserved. Distributed by AllAfrica Global Media (allAfrica.com). To contact the copyright holder directly for corrections — or for permission to republish or make other authorized use of this material, click here.